Do you love the great outdoors? Have you tried asking your kids to spend less time at home, glued to the TV and head outdoors instead for some nature-inspired goodness? If you have answered in the affirmative, then perhaps what you need to do is to “talk” to the younger generation on their terms and frequency. Give them a gizmo to play around with when they are out there in the wilderness, and you would have greatly enhanced your chances of receiving a positive answer from them to your request. Case in point, the £149.99 BioLite Camping Stove ought to ensure that you will be able to keep them wild animals at bay at night, cook your meals, and burn some zombies along the way just in case a Walking Dead scenario comes about. 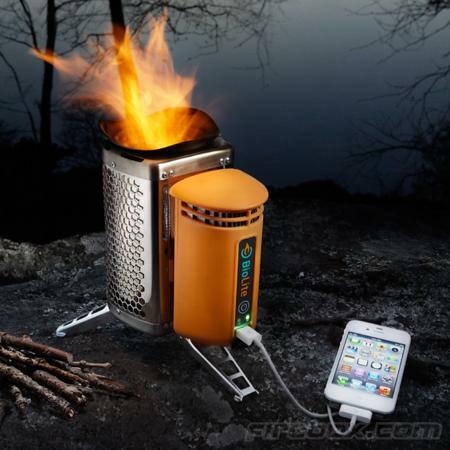 The BioLite Camping Stove is capable of cooking, heating and charging your electronic devices, where it does so by using renewable biomass including (but not limited to) twigs, pinecones, wood pellets in addition to other easily attainable flammable materials. A built-in fan will create the necessary airflow required, where it merges with the fuel chamber so that an ultra-efficient combustion fire is produced. All generated heat will be converted into electricity thanks to the Power Module which is then stored in the lithium ion battery, or it can be output to charge smaller devices. The included handy carry bag makes sure it remains nice and dry even when it is pouring outside, and it can be folded away quickly and easily just in case you want to escape from the eye in the sky in an instant. Tipping the scales at under 1kg, the BioLite Camping Stove ensures you need not tote around gas canisters, bulky chargers or heavy firewood ever again the next time you go camping.